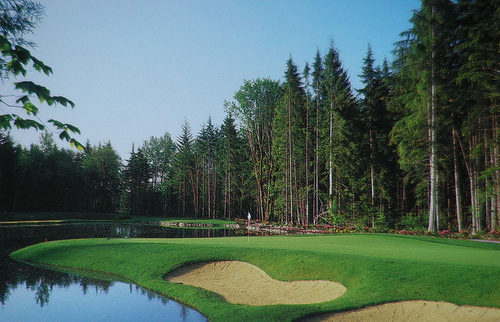 The Golf Club at Redmond Ridge is an 18-hole championship course with spectacular views. Active adults who want resort-style living in the Seattle area will be impressed by the luxurious lifestyle of Trilogy at Redmond Ridge in Redmond, Washington. This upscale golf community is designed to support mental, physical, and social health with a spacious clubhouse, tranquil spa, and active learning center. With eco-friendly homes and an exciting line-up of world-class amenities, Trilogy at Redmond Ridge offers truly luxurious living in the midst of natural, scenic beauty. Homebuyers frequently consider active adult communities based on their amenities, social events, and activities as much as their potential new homes. In Trilogy at Redmond Ridge, discerning buyers will be pleased on all counts. The amenities rival an upscale resort, while the homes impress with both their design and eco-friendly features. Trilogy at Redmond Ridge’s main clubhouse, Cascade Club, is a 32,000 square-foot facility packed with social and recreational amenities. The Center for Well Being helps residents stay in shape with fitness classes, state-of-the-art cardiovascular and strength-training equipment, and an indoor swimming pool. Fitness trainers are available on site, and the community’s own naturopath provides residents with helpful tips for healthy living. After a good workout, a trip to the full-service Tranquility Spa lets residents rejuvenate their minds and bodies with massages and beauty treatments. Outdoors, residents can stay active on the tennis courts or enjoy a round of golf. The Golf Club at Redmond Ridge features an 18-hole championship course designed by golf architect Gary Panks to highlight spectacular views of the Cascade Mountains. This scenic course winds through natural forests and sparkling water features to offer challenging play for golfers of any skill level. The Golf Club is also the setting of the Crooked Spoon restaurant. This casually elegant eatery is ideal for a lunch with friends or a special evening out. Friends can also meet up for coffee or a light meal at the Cascade Club’s Cyber Cafe, laugh over a game in the Billiards Den, or relax in the beautifully appointed Grand Living Room. The Club also offers an arts and crafts studio and a multipurpose ballroom. Beyond social and physical activities, Trilogy at Redmond Ridge helps residents stretch their minds through formal classes and casual special-interest groups. Residents can choose from a variety of classes through the University of Washington Center for Learning or explore a particular interest with a social club. Just a few of the popular groups in the community include clubs for ceramics, knitting, gardening, cards, travel, and line dancing. When it comes to homes, Trilogy at Redmond Ridge currently offers resale homes for sale. The homes are divided into four different collections and size from approximately 1,295 to over 3,000 square feet. Homes are designed to highlight architectural elements, such as large windows, open floor plans with spacious kitchens, and luxurious master bedroom suites. Many homes feature many eco-friendly and energy-efficient elements as well.